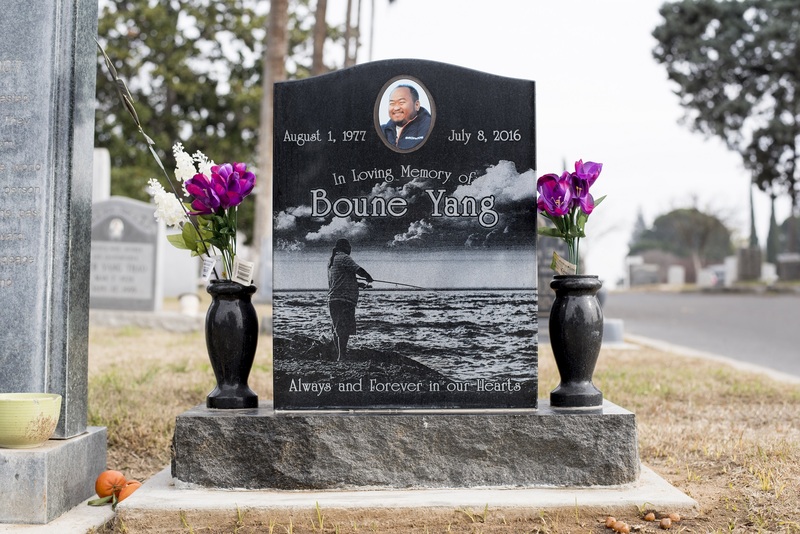 Memories In Stone | Headstones (cemetery memorials) in Fresno & Clovis, CA. Contact us today to make a monument to your loved one's life and legacy that will be made artfully in a timely manner. We also specialize in serving the many ethnic and religious groups of the Fresno area, in particular serving the Hispanic, Armenian, Orthodox, Hmong, and other communities. Upright headstones are visually striking, and keep the images on the face less impacted by weather and time. Check with your cemetery, or have us give them a call on your behalf, to ensure they allow upright monuments. Please keep in mind that laser engraving can only be produced on black granite, while all of our other techniques can be employed on any color stone of your choosing. Memories in Stone provides headstones that include angels or other statues, as well as fully custom headstones and commercial monuments. We also have a full range of memorial benches and cremation memorials. Even if you don’t see an example of what you’re looking for, please give us a call to begin working on your vision.